Officers of Worthington Foods and Miles Laboratories is a picture, with genre photograph. It was created in 1970. Worthington Foods is the Creator. Worthington Better Living Foundation is the Contributor. This photograph was taken at the merger of Worthington Foods and Miles Laboratories. 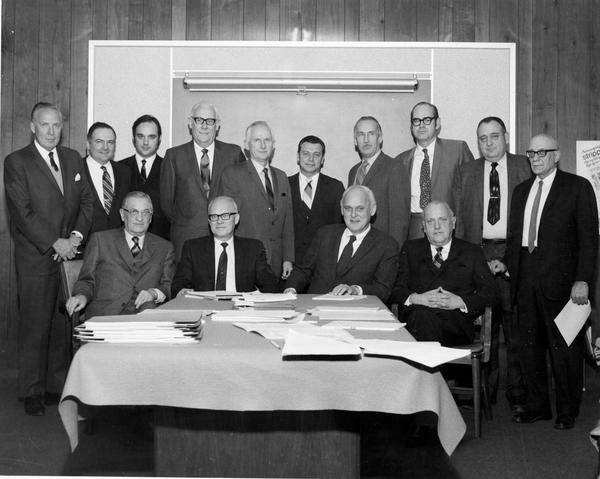 In 1970 market demands were calling for a Worthington Foods plant expansion to increase production capability and because a number of large nationally established food companies were showing interest in penetrating the vegetable protein foods market with plans to create a strong foothold in the market, the management of Worthington Foods decided to consider offers of a buy-out which were being tendered by a number of nationally known companies. Following a review of all options, a decision was reached to accept an offer made by Miles Laboratories, Inc. The merger proposal was attractive because Miles expressed a strong commitment to taking the marketing of vegetable protein foods to the public market. Miles was already producing and selling products related to the food and nutrition field, such as vitamins and Alka-Seltzer. Miles also indicated a willingness to re-sell Worthington Foods back to its former owners if it was not successful in meeting its objectives for the acquisition. In 1972 Miles Laboratories completed construction of a new Worthington Foods factory capable of quadrupling the production capacity of the existing plant. Miles also began investing significant time and money in the development of a line of vegetarian foods to be marketed under the brand name Morning Star Farm Foods, featuring low dietary Cholesterol for which a public demand had been created by publicity based on research done by the National Institute of Health. It features the organization Worthington Foods. You can find the original at Worthington Better Living Foundation. The Worthington Memory identification code is wbl0012. This metadata record was human prepared by Worthington Libraries on November 6, 2003. It was last updated November 16, 2017. Did you know that Worthington was once home to Worthington Foods, the world’s largest producer of vegetarian meat substitutes? Step inside our October exhibit for a look at the history of this innovative company.